WHAT IS THE NATIONAL POULTRY IMPROVEMENT PLAN? The National Poultry Improvement Plan (NPIP) began in 1935 to control pullorum-typhoid disease. This serious and highly contagious infection, which is passed from hen to chick, can result in devastating and repeated losses for poultry flocks. The NPIP is a joint program between the poultry industry, and the state and federal organizations, that is responsible for certifying that U.S. poultry and poultry products for interstate and international distribution are free of specific diseases. The NPIP sets standards that are used to evaluate the health of U.S. poultry breeding stock, hatchery, and poultry products. In this way, the NPIP strives to reduce or eliminate diseases that could be harmful to the poultry industry. Through voluntary participation in the NPIP, poultry owners can establish a record showing that they have tested their flocks according to NPIP standards. By demonstrating a history of negative test results or of proper responses to positive results, flock owners can achieve certification from the NPIP that their flocks are "clean" for a specific disease. Pullorum disease and typhoid disease are really two diseases, but they share such similar characteristics and symptoms that they are commonly referred to by a single name: pullorum-typhoid disease. Pullorum disease is caused by Salmonella pullorum bacteria, while typhoid disease is caused by Salmonella gallinarum bacteria. Through participation in the NPIP-led effort, commercial poultry owners have tested their flocks for pullorum-typhoid disease and eliminated carriers from their breeding stocks. This effort has been so successful that the NPIP has all but eliminated this costly disease from commercial breeding stocks. However, pullorum-typhoid testing needs to be continued due to continued exposure from imported birds and other sources. According to the World Animal Health information Database, even though a country may be declared free of pullorum-typhoid, it may have birds that can still harbor this disease. The USDA has reported that pullorum disease has been found in backyard flocks as recently as 2009. The mortality rate varies, but deaths from pullorum-typhoid can reach as high as 100%. For this reason, it is important for backyard farmers to engage in disease prevention to ensure that pullorum-typhoid is eliminated. The NPIP was founded in response to pullorum-typhoid disease and still works to keep it from spreading. Due to the effectiveness of the program, the NPIP has expanded and now monitors other diseases as well, including Mycoplasma gallisepticum, Mycoplasma synoviae, Mycoplasma meleagridis, Salmonella enteritidis, and avian influenza. As the marketplace for poultry grew in Indiana in the late 1800s, the Indiana State Poultry Association (ISPA) was developed through the efforts of poultry producers and the newly established Purdue University. The first association of Indiana Poultry Breeders was formed in 1875. After giving a successful winter exhibition, the "Indiana Poultry Association" was incorporated in 1918. The ISPA and leaders from other states worked together to develop the National Poultry Improvement Program (NPIP) and other programs that standardized and improved poultry production. Indiana law established the Indiana State Poultry Association as the official state agency for the administration of the NPIP. The ISPA leads Indiana's efforts in cooperation with the federal government's USDA, Animal and Plant Health Inspection Service - Veterinary Services (APHIS - VS) and the Indiana State Board of Animal Health. In other states, the official state agency may be a state department of Agriculture, a state veterinary office, or another government agency or state association, but the NPIP Provisions are the same throughout the United States. Today, the efforts of the ISPA are clearly visible. Nationally, Indiana ranks FIRST in duck production, THIRD in table egg production, FOURTH in turkey meat production, and Indiana produces millions of broiler chickens each year. The NPIP is one of the most cost-effective disease control programs in the world. The efficiency of the program is remarkable in relation to the number of diseases that it controls nationwide. The commercial poultry industry absorbs the majority of the program's costs. Commercial operations as well as backyard farmers are vital to the success of eliminating these diseases. The key to the program's success, however, is YOU! The USDA APHIS is responsible for publishing the rules of the NPIP as part of the Code of Federal Regulations. Every two years, proposed changes for the NPIP are requested. The proposed changes are distributed and then discussed at the NPIP Biennial Conference. During this meeting the changes are reviewed and voted on by delegates representing poultry producers, academia, and state and federal regulators. Any person producing of dealing in poultry products may participate in the NPIP when he or she has demonstrated, to the satisfaction of the Official State Agency, that his or her facilities, personnel, and practices are adequate for carrying out the applicable provisions of the NPIP. A participant must maintain all of his or her poultry hatching egg supply flocks and hatchery operations within a given state according to NPIP requirements. When a participant has flocks in one or more states, it is sometimes possible to reach a mutual understanding and agreement, in writing, between the participant's own Official State Agency and the counterpart agency in the other state(s). The only required classification for participation in the NPIP is "U.S. Pullorum-Typhoid Clean." ISPA offers two versions of the NPIP Blood Testing School. A Classroom based version of the school is offered for those seeking to become Certified Blood Testers for the first time. The Classroom based school is offered every April in two locations (Purdue University in West Lafayette, IN and at Purdue SIPAC in Dubois, IN). The Online Recertification School is only for those who have already taken the Classroom based Blood Testing School. 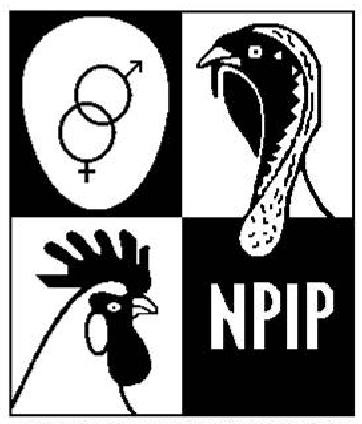 Your flock will be recognized as a participating member of the NPIP. Your flock will be given a approval number that can be used on shipping labels, certificates, invoices, and other documents for identification purposes. You will receive emergency disease management updates. Open shows as well as all Indiana 4-H shows require proof of disease free birds. The birds must be purchased from an NPIP certified hatchery or undergo PT blood Testing before they are allowed to show. As a Certified NPIP Flock Participant you would be able to show poultry without needing to do additional pre-show testing. Get an initial pullorum-typhoid blood test. A certified Blood Tester must sample 10 percent of the flock (a minimum of 30 birds to a maximum of 300 birds) when the flock is between 16 - 24 weeks of age. The ratio of male to female birds in representative samples must be the same ratio of male to female birds in the flock. The initial blood test must be repeated annually. Poultry includes all chickens, turkeys, and upland game birds going to an exhibition must be tested. Waterfowl, doves, and pigeons do not need to be tested for exhibition. To ensure the continued privilege of exhibiting poultry, owners must work together in this effort to keep all birds healthy and clean. This is important because how owners care for their own flocks can affect other flocks as well.